interest in dressage and sport horse competition, I decided that the Western Working family of Morgans with an emphasis on old California bloodlines would be the qualities I wanted in a Morgan. My search for a stallion resulted in the purchase of Gay Vaquero (Vaquero Mac X Gay Berta), a prepotent stallion who stamped his excellent conformation and gentle nature on his foals. He had a truly outstanding disposition and was one of the kindest horses I’ve ever owned. He just never had a bad day in his life. In addition to breeding, Vaquero was used as an all around driving and riding horse as well as being a western pleasure champion. Vaquero was rich in the bloodlines of old California breeders Richard Sellman and Roland Hill. Some of his daughters now form the backbone of LBF’s Foundation breeding program including LBF Gay Enchantress and LBF Gay Isabella and LBF Gay Catalina. His granddaughters will continue to carry his excellent qualities on through the coming generations. 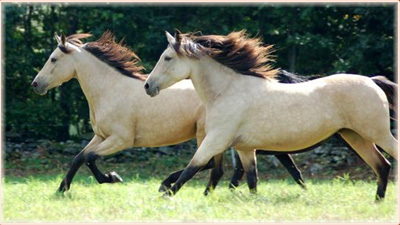 I became interested in colorful Morgans in 1994, purchasing the palomino mare Treasure Brightsun (Primavera Regalo X Treasure Incantation). I now have several colorful mares including Rocking M Rosa Lita, LBF Mona Lisa, her full sister Firefly, LBF Cajun Queen, LBF Memphis Belle and LBF Diamond Lil. 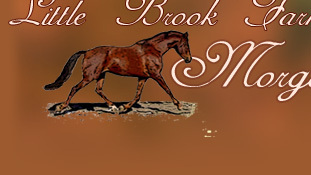 Little Brook Farm produces from two to five Morgan foals a year, breeding both to my own stallions, as well as to a variety of outside stallions, utilizing Old California and Western Working bloodlines. Those lines have given me the solid substance, excellent bone, strong solid feet and quality that I look for in a Dressage horse. In addition they naturally work off the rear end and have good freedom in the shoulder. They have a temperament quieter than some other bloodlines, making them eminently suitable for the amateur owner. Most are at least 15 hands tall. 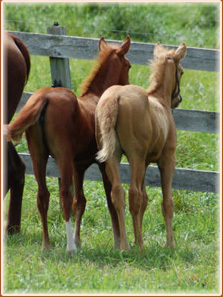 The resulting foals have been consistent in their quality and correct Morgan conformation. Currently, LBF bred horses are competing successfully in many venues including dressage, endurance, competitive trail, CDE’s and competitive driving. My current stallion, Triple S Wings of Wind (Triple S Red Wind X Primavera Ramona) is a 15.2 hand stallion with a very strong hind end, tremendous impulsion and the ability to sit down on his hocks and pivot in an instant! Before coming to Vermont, he was used to produce solid working ranch horses. The mares of Little Brook Farm are the cornerstone of my breeding program. They are incredible…smart, classy and beautiful inside and out. They have been dressage and carriage horses and have worked hard, competing very successfully for many years before becoming broodmares. Please take a moment to look at the Horses Sold page to see some examples of LBF bred horses and their accomplishments. My first priority when breeding foals will continue to be the creation of a Morgan horse with a good disposition over and above everything else. In making breeding choices, I look at conformation and movement in both the stallion and the mare, trying to match weakness to strength and improve upon both. I strive to breed a foal that can be an all around using horse, one that can do a little bit of everything and be a pleasure to the owner. Maintaining correct Morgan type is of great importance to me. 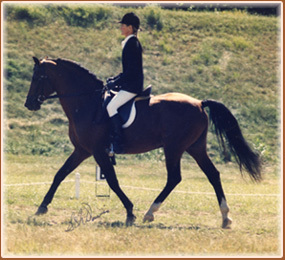 LBF bred horses are consistently both typey and athletic, with each generation an improvement upon the last. After more than 30 years of breeding Morgan horses, I am looking forward to the third generation of my program. Do consider an LBF foal if you are interested in a steady, pleasant, intelligent, sound, good using Morgan horse! Many thanks to every one who has chosen to view my site. I hope that you all enjoy it as much as Shelley Dodd and I did creating it. I would love to hear from you to know how you like it and if you have any suggestions. May your horses give you as much pleasure as mine do. Website by Shelley Dodd | "Three Stallions with Fall Background" graphic by Lynn Ponto-Peterson.